I don’t think I’m alone when I say that I enjoy colder weather mostly because it allows me to wear heavier fabrics. I anticipate the days I can pile on the layers and in particular, I love jackets. Like denim, most types of jackets have a story behind them. With the massive amount of options out there plus all these buying guides that talk about which jackets go with which styles, we thought we’d give you a look at how different jackets came to be. Naturally our obsessive nature led us down a long rabbit hole of articles, magazines, and online discussions. As expected, there is a rich history behind each and every one so here’s our quick-fire historical breakdown of many of the casual pieces of outerwear we all know and love today. The Deck Jacket was originally introduced in the 1940s for the US Navy during WWII with the intent of being very durable and warm jacket for sailors. They’re traditionally made with jungle cloth which is a tough cotton grosgrain fabric made to be rather wind and weather resistant and for the lining, alpaca was used to provide warmth. The deck jacket (also referred to as N-1) is meant to be fitted with a mid length that provides enough weather protection while ensuring mobility. The N-1 features details like concealed knit cuffs, drawstring waistbands replacing the knit ribbing to prevent snagging, and button wind flap protector over the zipper front enclosure. Vintage and reproduction deck jackets came in either a navy or khaki while modern interpretations of it can come in any variety of colors as well as different linings. The A-2, also known as the flight jacket, was first introduced in the 1940s for WWII US Army pilots. The jacket was made traditionally of horsehide, cowhide, or goat and featured two front pockets but no hand warmer pockets (hand warmer pockets were considered unsuitable in the military), wool ribbing at the waist, silk or sheep lining, a single leather piece for the back panel, and snap down dress collar. The A-2 is a shorter jacket designed to fit snug and sit around the hips which helped with fitting in a small cramped cockpit and stylistically made sense with the higher waisted pants of the era. Outside of reproduction jackets, many A-2 styled jackets now are lengthened to fit in more with modern styles as well being slimmer in the body. The MA-1, aka the “bomber jacket”, evolved from its predecessor, the B-15, when jet technology allowed planes to fly at higher (read: colder) altitudes and required a jacket that was lightweight, warm, and also made from water repellant materials because water would freeze on natural fabrics at colder temperatures. Typically, MA-1s are made from nylon (which offered better water resistance than leather) and feature a polyester lining. Many MA-1 jackets, both vintage and new, have pockets on one arm as well as a bright orange lining which originally served an important purpose: if the pilot is downed, they could turn the jacket inside out to be seen by rescuers. Like the A-2 flight jacket, the jacket fits on the trim and shorter side and now has been adapted and modified by brands to fit modern styles. The Field Jacket is probably one of the most mainstream military jacket seen today with countless brands offering their own version of the jacket with some being pretty accurate to others being only loosely resembling the original. The M-1965 jacket was widely used during the Vietnam War by the US Army and the designof the jacket was straightforward: it was made from a durable cotton sateen cloth that was treated to be water repellent and featured 2 large chest pockets, 2 front pockets, and a collar that could hold a roll-up hood. It was featured prominently in movies like Taxi Driver and quickly made its way to the mainstream during post-war times in the 1970s. Many vintage ones can be found at Army Surplus stores and for those looking for a toned down military look, brands across the board have M65 style jackets. See our full guide to the M-65 here. Peacoats have a very long history but it’s unclear exactly when this jacket was first created. The peacoat we know today may have been adopted by the US Navy from the nineteenth century Royal British Navy’s Reefer Coat which was a short, slim fitting, double breasted jacket with a slight flair around hips to allow sailors to have mobility while they climbed around the ship. As the peacoat grew more popular, the fit was loosened up a bit but still remained shorter in the body. Traditionally, peacoats are made from 100% 24-32oz wool although nowadays most are made from a lighter wool blend. One of the trademarks of peacoats is the large oversized collar with two additional buttons which is meant to be used to protect the neck if the weather got harsh. Nowadays there is a healthy market for vintage peacoats as well as conutless brands that offer their own version of the peacoat. The Perfecto jacket was initially created by Schott in the 1920s and subsequently became known as the iconic motorcycle jacket. The Perfecto fit is short in body for comfort while riding and with longer arms to cover up to the hands when arms are outstretched. It was meant to worn snug which was preferable for motorcyclists but was adopted by a wider audience with celebrities like Marlon Brando and The Ramones incorporating it into their own styles. Traditionally, it is made from horsehide or more commonly seen now in cowhide. Like with all jackets, there are several variations even with the ones made by Schott but they usually all share these basic design elements: asymmetrical front zipper, chest pocket, two hip pockets, double collar that opens up further down the chest, a waist buckle (more modern designs sometimes will forgo this feature), and silver colored hardware. 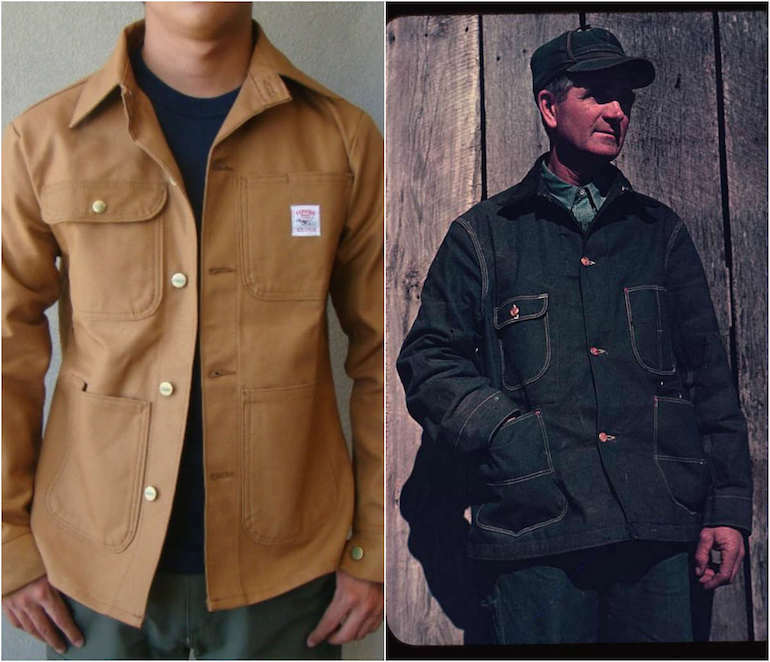 True to its humble name, the Chore Coat is a simple jacket that has its roots in the early twentieth century with American laborers, blue collar workers, and farmers. They enjoyed the coat for its simple functionality that was like the jeans they wore both in and out of work. The quintessential chore coat is made from a durable fabric like denim or heavy canvas and features an extended collar, one or two breast pockets, two hip pockets, a button up closure, and is slightly longer length that ends right above the thigh. Because of its minimal design to begin with, it’s hard to say exactly which jackets derived from the chore coat but with the resurgence of workwear in every styles, the traditional design is making a comeback with many brands, old and new, making chore coats. Although the Harrington jacket has been around since the 1930s, it didn’t get popular until the late 50s when it made appearances in movies by Elvis Presley in King Creole and gained its name when it was worn by Ryan O’Neal’s character, Rodney Harrington, in the TV series, Peyton Place. Originally designed as a stylish water resistant golf jacket, the Harrington jacket’s unique feature was a back flap that was modeled after an umbrella to allow water to roll off easily. Other Harrington hallmarks include angled flat hand pockets, a straight collar, a front zipper that went all the way up to the collar, and a cotton Tartan lining. Cotton or wool is generally the preferred fabric but nowadays it can come in a variety of natural and synthetic fabrics. With its roots in golf, the jacket initially was a balance between casual and more formal but since the mid-1900s, a wide range of styles have adopted the Harrington. Last up on our list is a jacket that is very familiar to those who grew up in the US school system. The varsity jacket started off in the early 1900s as a letterman’s jacket after the popularity of letter sweaters at Ivy League schools. High school and college students earned embroidered letters to represent their school and their various athletic, academic, and extra curricular achievements. The jackets usually featured a boiled wool body, leather arms in the school’s colors, ribbing on the cuffs and waistband, and would have a letter sewn onto the jacket to represent the school. Originally the idea was to remove the letters upon graduation but most people didn’t, so many vintage jackets today still retain original letters and patches. Of course, now varsity jackets are seen outside of schools with many brands creating their own varsity jackets to represent their brand.